Poster for the Nov. 4 meeting in Paris on 100th anniversary of Bolshevik Revolution. 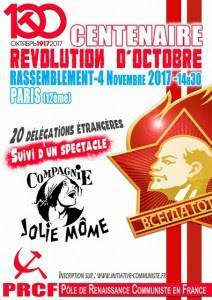 The International Department of Workers World Party sent the following message to the commemoration of the 1917 Bolshevik revolution to be held in Paris on Nov. 4 by the Pole of Renaissance of the Communists in France (PRCF) as a contribution to the discussion in which 20 communist parties worldwide are expected to participate. An Indochinese revolutionary was in Paris after World War I participating in debates in the Socialist Party (there was not yet a Communist Party) about the differences between the Second and Third Socialist Internationals. He described it later: “What I wanted most to know — and this precisely was not debated in the meetings — was: which International sides with the peoples of colonial countries? Your conference, called together by the MLPD, commemorates the 100th anniversary of the Bolshevik Revolution, the 1917 revolution that shaped most of 20th century history. The revolutionary quoted above called himself Ho Chi Minh. He was the political leader of Vietnamese independence and a founder of the Communist Party there. Ho is a treasured hero of the working class as well as of his own workers and peasants worldwide. In 1919, at a time when Russia was not in a position to give much material help, the words of Lenin — backed by the 1917 revolution — were enough to inspire an Indochinese revolutionary. They brought the liberation struggle of the workers and peasants of Vietnam into the camp of the proletariat in the global class struggle against imperialism. Before a decade had passed, there were communist parties organizing anti-colonial struggles in China and in Korea, and there were massive changes in the Central Asia countries that were then part of the Soviet Union. Though the revolution failed to spread to the more developed imperialist countries in Europe, communist movements for workers’ power joined with the anti-colonial movements, especially in Asia at that time, and later in Africa and Latin America. During that period, the Soviet Union developed as an economic and military power. The USSR was able to defeat Nazi-led German imperialism during World War II. It also gave valuable military and economic aid to liberation movements on the three continents that were dominated by world imperialism. Even at a time when the USSR was not actively calling for revolutions, its very existence as a socialist state was a bulwark against the U.S.-led imperialist world. Since the 1991 dismantling of the Soviet Union and its Eastern European allies, this bulwark against imperialism has also disappeared. As soon as there was no USSR, the United States and its NATO allies moved their militaries both into Eastern Europe and throughout Western Asia and North Africa, from Yemen and Afghanistan through Syria and Libya, to reconquer the former colonies. 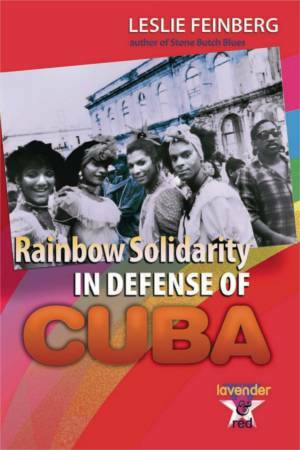 The problems now for the former colonies in maintaining their sovereignty underline the importance of the 1917 revolution in opening the door to struggles for liberation and national independence around the world, first by inspiration and then with material help following World War II. Long live the Russian Revolution of 1917!